So, another chicken dish today by far? Previously, can you still recall my Curried Roast Chicken? I hope you can still remember? 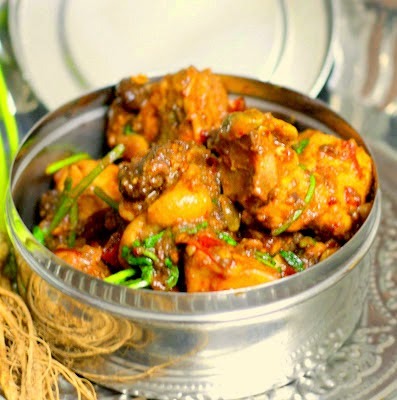 Otherwise, perhaps you would like to flip over to the recipe and then, get up, close and personal to this Chicken Varuval, also known as dry style masala chicken (Jacket Potatoes Chicken Mince). One which I think is not the standard like the many Chicken Varuval. My version of course, as usual, must have the touch of me. A touch of natural sweet burst from dried raisins. Just a touch, nothing over-powering, a touch for the role play between spiciness, sweetness and awesome aroma of garam masala and coriander leaves (Honey Chilli Chicken & Sweet Chilli Chicken). Anything else is there for me to say (Butter Chicken, Ayam Masak Merah & Cashew Nut Masala Chicken)? I sincerely doubt. Mix onion paste, ginger paste and garlic paste with chicken. Heat oil and when heated, fry chillies and raisins for 1-2 mins. Add chicken mixture and garam masala. Simmer and cook till chicken becomes soft and tender. Off the heat and combine in coriander leaves. 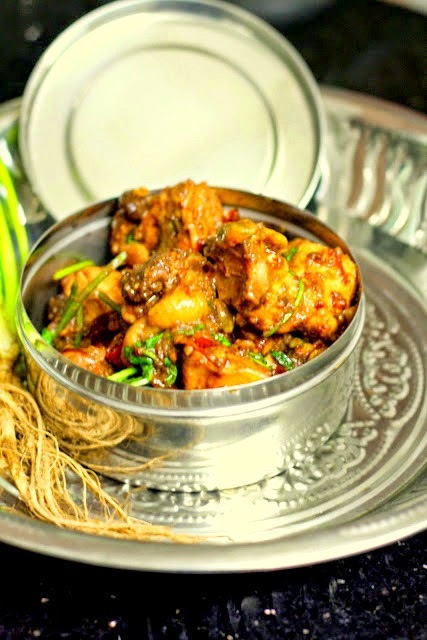 dried chillies and raisins do pair perfectly in this dish which looks absolutely spectacular! With raisins? I wonder how it taste. Spicy chillies and sweet raisins would have given a nice bite to this chicken. Such a nice dish. Never tried raisin and chicken...Sounds too good. I love the addition of raisins to chicken...I think this looks delicious! Great pairing of the chilies and raisins, definitely would compliment the chicken very well. You do have a knack for choosing some awesome flavors when preparing chicken, well done! I love spicy chilies with chicken! The raisins sound like they would be a fun addition. How interesting! I think I would love this, I very much like lamb with honey and raisins. Looks like a wonderful meal packed with flavor. I've never seen anything quite like this, but it looks amazing. Love how you've presented it in that silver bowl! Wow - that is stunning. I love the idea of raisins in this...I like a sweet element in a savory dish. sounds great nava!!! i never tried it before.. how was it? the combination of raisin and chicken?? Thanks so much everyone for all the loveable comments. I'm good with anything spicy! Looks delicious! I dig the idea of sprucing up the two separate flavors (raisins & chillis)by using them together :) I bet you get a completely new and delicious flavor. Great dish! Sounds and looks fantastic! Love the spicy and sweet combination here. I just ate lunch but looking at this very appetizing chicken dish makes me want to grab a bowl of rice and eat again! I like you added a sweet ingredient like raisin that must be an amazing taste. This is a innovative combo. Looks awesome! This looks so delicious and yummy! !